This is certainly the bumpiest road to Oscar I have ever seen. The Race has taken ANOTHER severe, right-angle turn, with “Boyhood” and “The Grand Budapest Hotel” winning the A.C.E. Eddie awards last night. Effectively stopping “Birdman”s new- found momentum from last weekend’s the PGA and the SAG Award in its’ tracks. Why? The Film Editors are considered the most important voting group after the MASSIVE Actors Branch and Guild (who dominate and who gave out its’ SAG awards last Sunday) and for “Boyhood” it was a very, very important turn-around in fortune, and for “Grand Budapest Hotel” too. A.C.E. is the organization that represents the Editors Guild. Which has a lot of members as opposed to the Academy’s Editors branch, which is smaller and more elite. And the Eddie is the name they call their award. It broke down like this ~ Best Edited Feature Film, Dramatic, “Boyhood” Sandra Adair. And Best Edited Feature Film (Comedy or Musical), “The Grand Budapest Hotel” Barney Pilling. “Birdman,” of course, has those long(some would say ENDLESS) tracking, stedicam shots, which makes the film look like it isn’t edited, but of course, it is. It wasn’t shot in one, long, continuous take. But it was meant to look like it was… which is kind of an anti-editing stance, if you think about it. And “Boyhood” shot over 12 years…can you IMAGINE the Degree of Difficulty of editing THAT much footage into something watchable? Of course, some could say that didn’t happen. That it’s a mess rather than a melange. 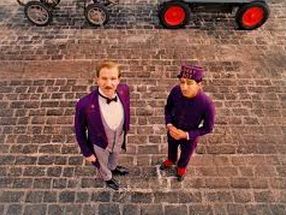 And “Grand Budapest” has all those nifty, changing aspect ratios. Of these three films, “Grand Budapest” is still far and away my favorite. But a shift of momentum, for “Boyhood” to “Birdman” is now NOT officially happening. At least according to the all-important editors. Next stop, BAFTA! Where “The Theory of Everything” will probably sweep. And Eddie Redmayne Had This to Say….